Childrens’ wishes in the southland were delayed today, according to reports from several preschool teachers, school administrators and public playground officials. The cause for the delay was not immediately known, but its effects were intensely felt, especially by those in the preschool and kindergarten age groups. Sullen toddlers quickly became inconsolable when their wishes no longer could take to the air and promise hope. Scores of overtired and cranky parents protested the delay, asking for immediate action by the mayor. The major unfortunately had not been briefed on the situation, as all his advisors were too mature, so he had no answers to satisfy the crowds crying out about the crisis. Sensing that something organic might be behind the crisis, this reporter scouted the grassy areas, concentrating on parks and school playgrounds trying to find the root cause of the problem. After some intense weed watching the above specimen was discovered in a neighborhood park adjacent to two preschools, a church and an elementary school. It seems this dandelion is in a state of arrest, or as it is sometimes known, a “Delayed Wish Take Off Syndrome”. 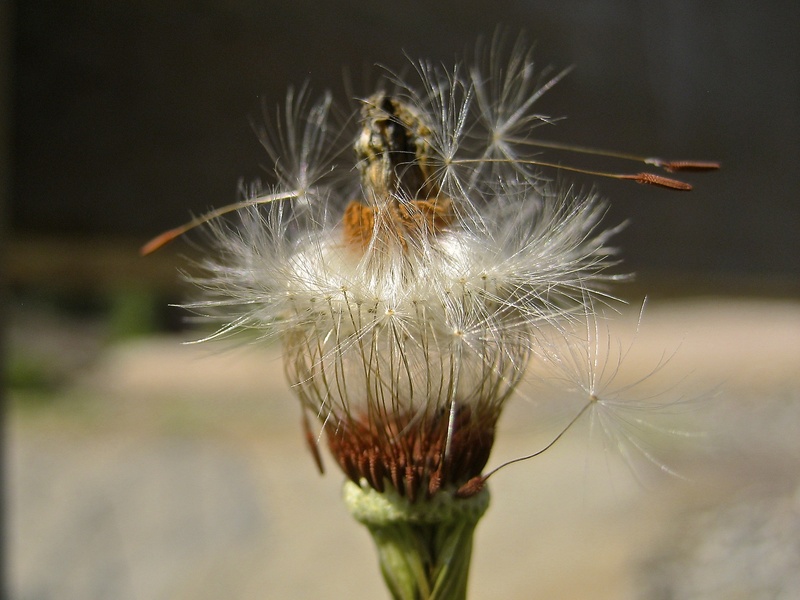 In “Delayed Wish Take Off Syndrome”, or “DWTOS”, a dandelion’s tufts will fail to deploy in an accurate or timely manner once a wish is made, no matter how hard the wisher blows. Due to some irregularity in the dandelion’s growth cycle, or perhaps uneven irrigation such as cessation, or even overwatering, the dandelion’s petals become sodden and coated with a sticky substance which adheres to the wispy tips of the dandelion’s wish tufts, glueing them in place for some time. This delays their take off until the sticky mess evaporates in the hot sun. During a period of overcast or cloudy days, for instance during June Gloom, when the dandelions do not have the opportunity to dry out, DWTOS can last for days. On normal warm days however, DWTOS is relatively short lived, usually lasting only until the afternoon when the temperature rises enough to free the wispy tufts from their sticky bonds. At that point a frisky breeze provides the solution to the problem and wishes are allowed to take off in rapid succession, to help make up for the delay. I brought my findings to the school officials who glanced at me askance and asked me to leave the premises. Fortunately my news about the situation was better received at an afternoon birthday party at which a dozen or so toddlers were in attendance, accompanied by their parents and several bored older siblings. When I assured the small children that their wishes would soon float into the air, and that I had solved the reason for the setback by scientific sleuthing, an enlightened party hostess invited the children to all hunt in the grass for dandelions that needed extra help in deploying their wishes. Pure of heart, they all energetically set themselves to the task of searching out dandelions and blowing on them enthusiastically. It was a happy ending to a frantic day, and I was invited to stay for cake. Yum!